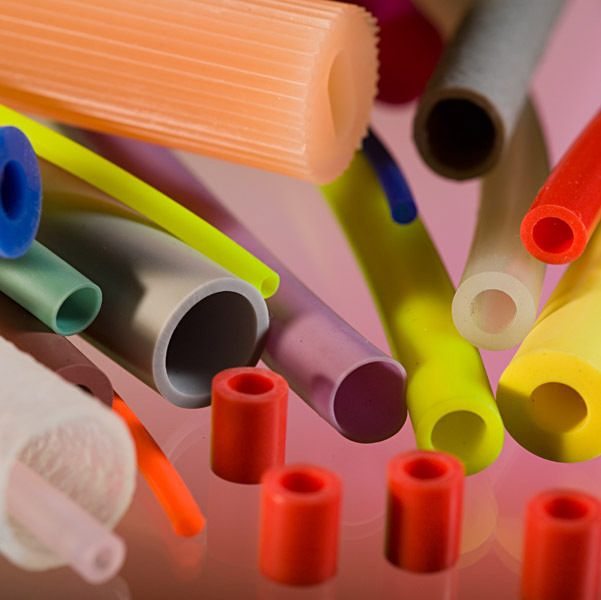 Adpol extrudes and moulds a wide range of custom Platinum Cured Silicone Rubber products at competitive prices. Unlike the traditional Peroxide cured materials Platinum Cured Silicone Rubber does not use peroxides or ketones as part of the catalysing process which can sometimes leave trace elements after post cure causing contamination or effecting taste. As a result Platinum Curing is becoming a more popular choice in medical, food, drink or dairy applications. Platinum Cured Silicone Rubber also offers improved clarity, particularly important in translucent products which can yellow over time with a peroxide catalyst. It is also possible to tint with a specified colour to achieve a unique look. Tube, cord, profiles, moulded parts, joined gaskets or O rings, sheet and punched gaskets/seals are all avaialble. Please contact us with your requirement to see if we can help.